The additional data is a Department of Work and Pensions (DWP) spreadsheet showing the caseloads and outcomes for the Work Capability Assessment (WCA) process for Employment Support Allowance (ESA). This spreadsheet tells a completely different picture from that which Shapps & co have been peddling. This is the picture Shapps was trying to paint. In this graph, the red line shows the total caseload of WCAs and the blue shows discontinued claims. As you’d expect, in both cases you see a ramping up when the rules first come into force, as it takes time to switch over from one system to the other. But then you see an almost constant blue line, with around 20,000 a month (or 60,000 a quarter) being discontinued. 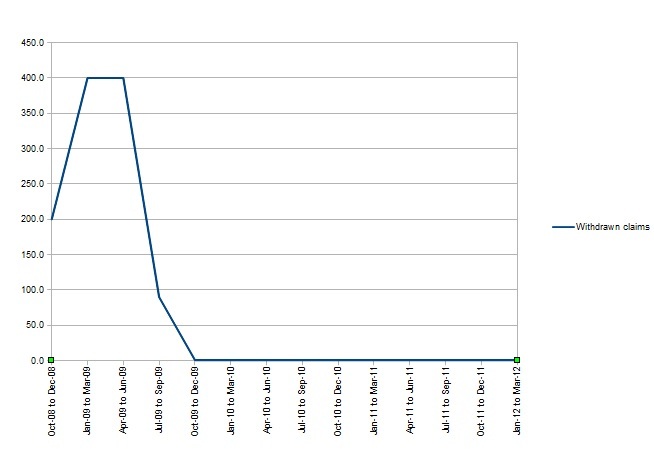 This represents nothing more than ‘churn’ – a turnover of claims withdrawn because of perfectly normal things like people getting better, or finding a job they can do even if they’re ill. As Declan Gaffney points out in his article, every month around 130,000 people come off ESA anyway – it’s not a lifetime benefit, it’s something you claim for as long as you need to. Because of the huge numbers of cases always in the pipeline and the amount of time it takes for them to be assessed and decided, some of the people who no longer need to claim haven’t even had their WCA yet – and they become part of that month’s ‘20,000’. Now look at the relationship between the two lines. Until around April 2011, they stay more or less in sync, with the ‘total caseload’ red line obviously higher, but the blue line tracking it proportionately. From April 2011, the caseload line rockets – but the blue line stays constant. This shows how the current government intensified its WCA scrutiny of disabled people – but the number of discontinued claims stays the same, and even goes down slightly toward the end of the data while the red line climbs steeply. If, as Shapps is claiming, the scrutiny was revealing large numbers of people on disability benefits who shouldn’t really be claiming, you’d see the blue line keep pace with the red – or even start to close the gap. But you don’t – all you see is the same old ‘churn’. New hospital kills 120,000 people! It would only take a look at the data to see that the death rate was the same as usual, and that the headline was nonsense – but a lot of people wouldn’t know where to look, or want to bother to look, and so might be fooled. You might have mobs attacking the hospital to burn this ‘deadly edifice’ down – all because of the cynical, knowing abuse of information. This is exactly what Shapps is doing with his ESA claim, with the support of the usual suspects in the media. If people are fooled, it can lead to increased attacks on disabled people as the ignorant assume they’re probably just idle lead-swingers – and even of those not moronic enough to attack people physically, many will be fooled into standing by while the government conducts its no less deadly financial assault on the vulnerable (disabled or not). This makes Shapps’ ploy even more cynical, even more damnable and even more criminal than it first appeared. The ‘man’ should be railroaded out of office faster than you can say ’employment support allowance’. But in this government, it probably means he’s in line for a promotion. What can we do to hold them to account. I for one would like an apology, a public one. I’m afraid enough as it is without Schapps inciting more hate. I think we’ll have to hold our breath until we can jeer as they trudge away from Downing St and Whitehall, sadly. Lmao – I was willing myself not to do that. And then did it anyway! Steve Walker nails the government’s disability lies. 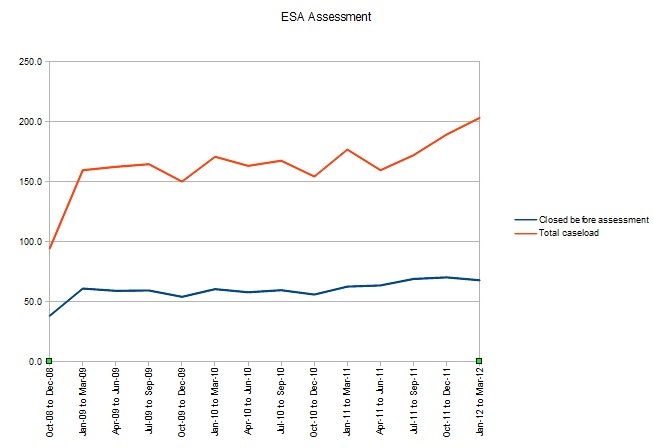 If anyone tells you that Grant Shapps is saying scroungers are dropping ESA claims because they would be assessed for their level of disability, just point them to this article, which uses the Department for Work and Pensions’ own figures to prove that an increased caseload of work capability assessments has caused the number of abandoned cases to drop. That’s right – DROP. MORE people are having their cases approved under the new, stricter regime. The number of abandoned cases is down to natural wastage – ESA is not a benefit for life and people stop claiming when they get better, or find work they can do despite still being ill.
Iain Duncan Smith’s £53 per week Diary. MONDAY: Fortify myself for the week ahead with a half-bottle of the ’05 Pinot Gris Rotenberg. Cost £62, but if I’d been on the dole for a while I’d have had the £9 spare from the week before. Stick candle in empty bottle and spend rest of day sitting in my bedsit thinking about Samantha Cameron. Tuesday: Neighbours offer me building site work for undeclared cash. Contact benefits agency to report them and tell neighbours they’re bringing this country to its knees. Use empty Rotenberg bottle to fend them off and barricade myself in my bathroom. Wednesday: Woke up to see a big dog on pavement. Remained indoors. Thursday: Get into furious argument with chap at local antique dealers, ‘Cash Converters’, who insists they don’t deal in 19th Century watercolourists. Finally get £10 for the frame. Money stolen by children waiting for me outside. Friday: Electricity stops working. Investigation shows I have some kind of meter that appears to be empty. Assume this is an annual thing and well outside the scope of my £53 budget. Keep warm by eating a pack of animal nuggets left by previous occupants. May have sobbed a little bit. Saturday: Neighbours apologise for calling me a ‘jumped-up ballbag’ and offer to pay for an 18-hour holiday to Jamaica if I would ‘run a little errand’ for them. Big Society in action. Sunday: Final day. Secretly borrow a fiver from old woman who lives downstairs. Use it to buy delicious three course lunch at House of Commons restaurant. That evening the lovely people from ATOS take me to Savoy Grill for dinner. Twitter pointman Declan Gaffney turned into ex-Eastenders actor Dean Gaffney halfway through this article. Oops. Great point – thank you! Because I don’t know about it yet – tell me more? Incidentally, another problem with their claims is that to conclude, without further evidence, that the reason someone has not pursued their claim under the new system is because they don’t want to be discovered as a cheat is incredibly erroneous. There could be any number of reasons why people may not pursue a claim under the new system; one of which being that they simply do not have the strength or ability (because of their illness or disability) to jump through all the required hoops, especially in the current atmosphere of fear and intimidation. Another way for the government to skew the figures; make it impossibly difficult for disabled people to claim disability benefits, and then claim that there are fewer claims and ergo fewer disabled people. Beautiful false logic. Absolutely. That point was made very clearly in the ‘L’art social’ blog I linked to, so I decided not to re-make it and to focus on my specific points, but thanks for the comment – couldn’t agree more! Reblogged this on Sociology + Social Policy = Sociopolocy.